Doom is the thematic incitement for the third issue of cléo, and we invite writers to consider its diffuse, spectral, and ominous meanings and representations in film. Doom is sensory and it is visceral. It portends calamity, catastrophe, apocalypse, death, tragedy, annihilation. Yet doom is also a form of prescience and a mode of intuition. It signals things to come. We are interested in the political connotations of apocalyptic narratives, the cultural significance of doomsday films, representations of extinction, and the shapes that death and mourning are given in cinema — to name only a few potential starting points. When is ruination ritualized, and why? What does it mean to actively chase death or come face to face with it? What is the relationship between doom and illness? In light of the city of Detroit’s decision to file for bankruptcy in July 2013, what are the racial and financial valences of doom? What does it mean to be doomed? The theme of doom spans various genres and eras in film history, and we are looking to represent this varied range. 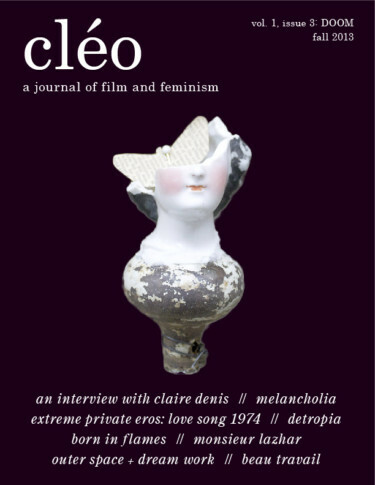 cléo is invested in feminist critique and thoughtful analysis informed by feminist perspectives. Objects, when combined thoughtfully, create an altar and an archive. Singular pieces, despite their histories, merge to form a new re-contextualized narrative. In this way, the mundane becomes elevated as discarded elements transform into artifacts. 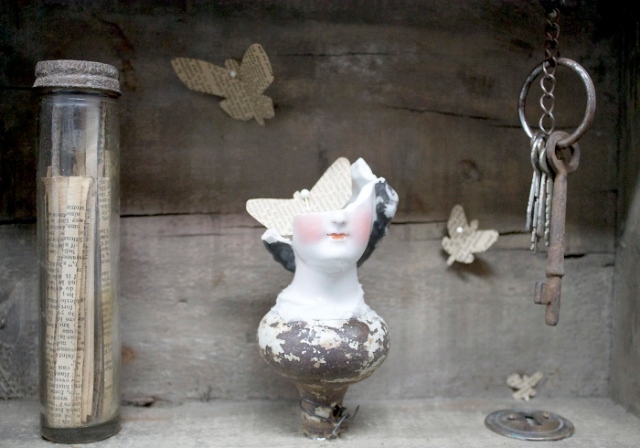 My assemblage works represent a continuing exploration of life, death, and immortality. Wooden boxes, old bottles, rusty nails, broken bits of ceramics, and other cast-off items are hunted and collected for their intrinsic beauty. These elements are then carefully combined in unexpected ways to create art filled with layers of iconic meaning that evokes deep, emotional responses. I ask viewers to consider the shadowy corners of the psyche, storytelling, and how art and material culture serve as receptacles of communal memory and perhaps immortality. 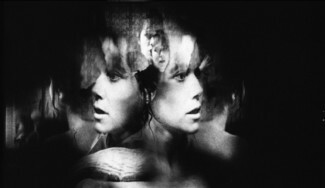 Monica Bodirsky is a Toronto-based artist, designer, and craftsperson who has exhibited locally and internationally. She holds a bachelor’s degree in Design, and when not exhibiting, teaches at OCAD University in Toronto.